I am looking for a good source on group theory aimed at physicists. I'd prefer one with a good general introduction to group theory, not just focusing on Lie groups or crystal groups but one that covers "all" the basics, and then, in addition, talks about the specific subjects of group theory relevant to physicists, i.e. also some stuff on representations etc. Is Wigner's text a good way to start? I guess it's a "classic", but I fear that its notation might be a bit outdated? Well, since I don't know too much about group theory, I therefore also don't exactly know what I want. Seems that representations is the thing to look for. Should this be CW? I guess not, but I wasn't sure if we should run it as a list question for book recommendations. There isn't just one correct book to use. There is a book titled "Group theory and Physics" by Sternberg that covers the basics, including crystal groups, lie groups, representations. I think it's a good introduction to the topic. "This book is an excellent introduction to the use of group theory in physics, especially in crystallography, special relativity and particle physics. Perhaps most importantly, Sternberg includes a highly accessible introduction to representation theory near the beginning of the book. All together, this book is an excellent place to get started in learning to use groups and representations in physics." This book has been suggested to me by one of my (physicist) teachers, so I am giving +1 in his sake :) For some reason, I've never looked at it though... should check it out. Sounds like something I should look into. Thanks. I would recommend A. O. Barut and R. Raczka "Theory of Group Representations and applications". It is about Lie algebras and Lie groups, and you are asking for general group theory, but this book, in my opinion, would be useful to a physicists. The applications are to physics, mainly quantum theory. Edit: Forgot to comment on the last part of the questions. I think Wigner is a good read. You'll not learn much about general group theory, but you will learn about representation theory of the Poincare group and some general techniques from representation theory like the Mackey machine for induced representations. +1 This is a very very nice book, but sadly out of print. Out of print suggests that many people liked it. 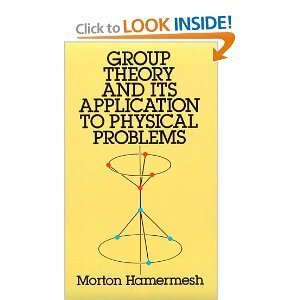 Morton Hamermesh's Group Theory and Its Application to Physical Problems is a Dover Press book, so quite inexpensive (though the price seems to be up a bit since I bought it in the '90s). Dover Press reprints include a lot of good books on group theory for physicists. Unfortunately, I have not seen any such book that meets ALL the requirements the OP is asking for. But I think he could do well either with Georgi's (expensive) book mentioned below, or with Hamermesh AND Heine AND Lipkin from the Dover Reprints. You can even sample these books on Google Books with the Preview feature. This post imported from StackExchange Physics at 2014-05-04 07:46 (UCT), posted by SE-user Matt J. Well, in my dictionary "group theory for physicists" reads as "representation theory for physicists" and in that regard Fulton and Harris is as good as they come. You'll learn all the group theory you need (which is just a tiny fragment of all group theory) along the way. A very good book for everyone, although the main portion of it is structure theory and representation theory of semisimple Lie algebras. Yes, but my impression is that algebras are more important to physicists than groups. I may be wrong. Goodman and Wallach is for mathematicians, but if physicists find it useful then I would too recommend it. It is quite lengthy though. agreed, this is a great book, but I think is more on the mathematical side. @MBN: I am not sure it is for mathematicians (mainly because I am not one :)) but its content is definitely for physicists (at least I find basically everything very useful). On the other hand, I know many people would dislike the theorem/proof composition and algebraic geometry approach also need not be to everyone's liking. On the third hand, it was this book that gave me motivation to learn some algebraic geometry. @MBN: is that really the case? What about e.g. special functions and systems of orthogonal polynomials? These are used heavily in physics but I doubt mathematicians would find them that useful. In my opinion there are lots of math topics like this one, which mathematicians would consider just as applications to physical problems and so not very interesting. But perhaps I should try MO, hard to get a definitive answer without asking mathematicians themselves. @Marek: There are many mathematicians that are doing research in those areas and know nothing about physics. I personally recommend Georgi's book. And there is also Rammond's book, which is along the same lines as Georgi's textbook. Sternberg's book is excellent and illuminating but perhaps a bit hard for a beginner. I recommend as a first reading Lie Groups, Lie Algebras, and Representations. The book deals with representation theory of Lie groups of matrices. After reading this I also recommend the Sternberg's book for physical applications and the topological point of view of group theory. I like Hall's book quite a lot. I took a course on group theory in physics (based on Cornwell) and even though I followed all of the proofs, I had no idea how it might help me solve physical problems until I picked up Tinkham's Group Theory and Quantum Mechanics. Literally just reading 5 pages (the introduction) made a tremendous impact on my understanding of why group theory is important to physical applications and what sort of group/representation properties I should be looking for. After almost every major group/representation result, he shows how it relates to a quantum calculation. His approach and examples might be considered dated (not much on Lie groups and a lot on crystallography) but if you're just getting acquainted with the field, I think it's the best around. I am surprised no one has mentioned Lipkin yet. His "Lie Groups for Pedestrians" uses notation that is not too out of date, since it was written in the early 60s. He covers the use of group theory in nuclear physics, elementary particle physics, and in symmetry-breaking theories. From there, it is only a small jump to more modern theories. Georgi's book (mentioned above) may be even better, but it is awfully pricey: as a Dover Press book, Lipkin's is quite cheap and easily available. It can even be downloaded as a PDF file from 4shared. Or bought as an e-book from Google. Even the Preview on Google is not bad, being surprisingly close to complete. Lipkin does assume the readers knows quantum mechanics at about the sophomore physics major level, since the quantum-mechanical angular momentum operator is basic to his whole presentation; he also assumes familiarity with Dirac's bra and ket notation. But I am sure that is not asking too much. The author has also co-published texts on contemporary particles and elementary particle theory, some parts of which discuss real life applications of group theory.